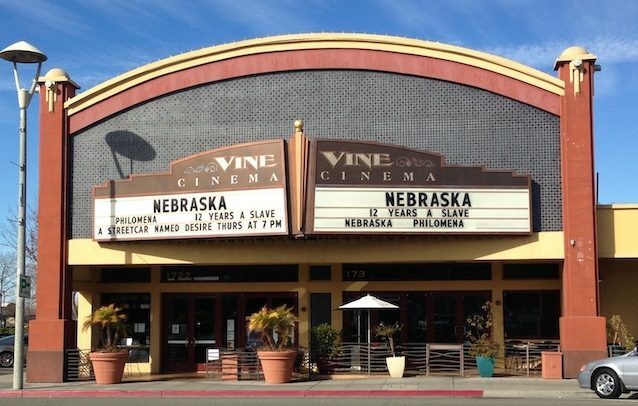 The Vine Cinema & Alehouse is not your ordinary movie theatre. Considered one of “Livermore’s most unique experiences,” we are a complete date night wrapped into one! People come for the amazing food, beer & wine selections all delivered to your table or couch inside the theatre. More people enjoy the independent films, live sporting events and classic films – so much more quality content than the normal movie house. Finally, even more people enjoy the adult atmosphere, the friendly & knowledgeable employees and the most amazing popcorn in the Tri-Valley! For a listing of nearby restaurants and stores, visit: www.livermorechamber.org. From Walnut Creek, take Highway 680 South and connect to Highway 580 East towards Stockton. Exit at North Livermore going towards downtown. Take the Central Livermore off-ramp and merge onto North Livermore Avenue. Turn right onto First Street. Parking in back rear lot. From Oakland, take 580 East towards Stockton and follow directions above. We ask that you do not bring bags and briefcases larger than 12″ tall by 12″ wide and 6″ deep into the Century 16 Theatre and Vine Cinema. We reserve the right to inspect all bags. Following each screening, all festival-goers will be asked to take all their belongings and exit the screening room where the film has been screened.